Former presidential candidate Carly Fiorina and all nine Republican statewide candidates in Virginia are speaking at tonight’s sold-out Prince William County Republican Lincoln-Reagan Dinner at the Heritage Hunt Golf & Country Club in Gainesville, VA, according to a news release from GOP leaders. The Republican nominee, Del. 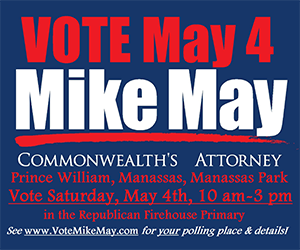 Jackson Miller, for the April 18 Special Election for Prince William and Manassas Clerk of Court will also be introduced tonight. The Special Election is to fill the vacancy due to the death of Michelle McQuigg on Feb. 15, 2017. All statewide candidates will speak at VIP Reception beginning at 6 p.m. The dinner program begins at 7:30 p.m. with remarks by Republican Party of Virginia Chairman John Whitbeck, Rep. Barbara Comstock (VA-10), Rep. Rob Wittman (VA-01), Keynote Address: Carly Fiorina followed by announcement of straw poll results for governor, lieutenant and attorney general. The four Republican candidates running for Governor are Corey Stewart, Prince William Board of Supervisor chairman. Ed Gillespie, businessman and 2014 Senate nominee (Fairfax County), State Senator Frank Wager (Virginia Beach), and businessman Denver Riggleman (Nelson County). The two Republican candidates for Attorney General are Virginia Beach attorney Chuck Smith and Richmond attorney John Adams. The three Republican candidates running for Lieutenant Governor are State Senator Bryce Reeves (Spotsylvania County), State Senator Jill Vogel (Fauquier County), and Delegate Glenn Davis (Virginia Beach).